I’ll be the first to admit that when I was first told I’d be learning to make paper I was … well …a bit disenchanted. I had just arrived in England, and though I didn’t understand what people were saying to me half the time, I thought at least I knew what a piece of paper was. As I stood in that cold, damp paper studio beating pulp for hours and pulling sheet after sheet of paper, I had nothing else on my mind but a cup of hot tea (it was England after all) and dry socks. 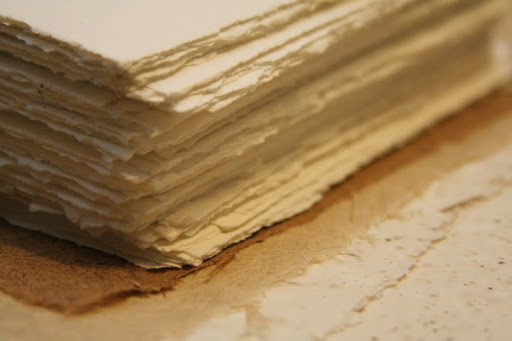 It wasn’t until I removed my first handmade sheets of paper from the felts a few days later that it started to dawn on me just how singularly incredible the act of creating a sheet of paper was. My paper was a disaster. It had permanent buckles on the edges and perfectly circular holes where water drops had shattered the fiber pattern. They were either mushy sheets as thick as felt with not enough sizing or brittle films that might have been more sizing than pulp. Over the next few months, I learned what I was doing by making hundreds of sheets of paper. I started studying up on the moulds and deckles — the tools of the papermaking trade. I learned patterns of pulling the fibers of the pulp in varying directions to layer stronger sheets. A few months beyond that and I could pull a sheet of abaca so thin and strong that I could print etchings on both sizes of the page and the images would merge. I started collecting printing papers, watercolor papers and drawing papers and began compiling my own paper-sample drawers. That was the beginning of my appreciation of paper. No other material has such a dichotomy of potential and worthlessness — so valued in our civilization’s history and at the same time disposable without a thought. It takes its place in museums in the form of treasured documents and as a part of priceless works of art. I can also shove a paper receipt in my pocket to remind me of how much I spent at Target. When the museum asked me to write this, I chuckled to myself at the irony of blogging about paper. I started wondering what will happen to its place in our culture. Then I went digging around my studio to find my first wrinkly attempts at paper: My feet instantly felt cold again, I could smell pulp being beaten and I heard a teakettle humming. I had an uncontrollable desire to create something — anything. I knew paper was going to be just fine. On Tuesday, Jan. 26, the VMFA Book Club presents Pulp Non-Fiction: The Making of Paper with R. Sawan White at 6 pm in the Pauley Center.